2. In the bowl of an electric mixer, combine the sugar and butter beating at medium speed until fluffy. 3. On low-speed, add the banana, milk, greek yogurt and eggs mixing until combined. 4. In a small bowl, whisk together the flour, baking soda and salt. 5. Keeping the mixer on low-speed and slowly add the dry ingredients to the wet ingredients. 6. Beat just until blended. 7. Add the pecans and stir briefly. 8. 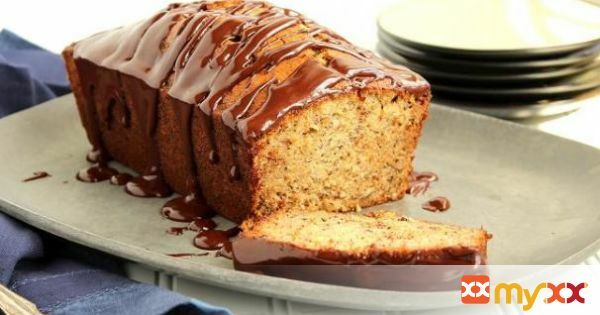 Pour the batter into a 9×5 inch metal loaf pan coated with cooking spray and bake at 350 degrees for 1 hour or until a toothpick inserted into the center comes out clean. 9. Cool in pan for 10 minutes on a wire rack. 10. Remove from pan and cool on rack. 11. Place the heavy cream and chocolate in a microwave-safe bowl and microwave at high for 1 minute or until chocolate melts, stirring every 20 seconds. 12. Cool slightly and spoon over bread.